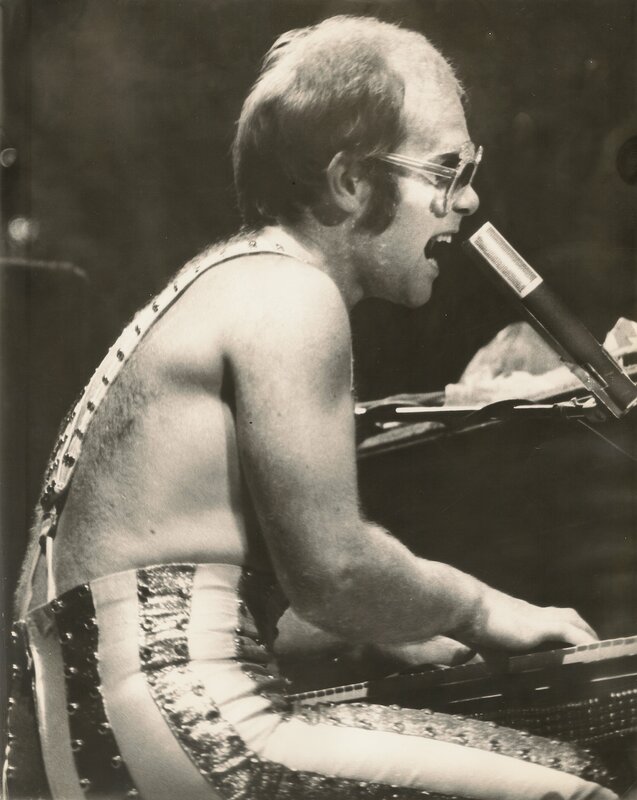 Elton John was huge in 1974—about as popular and successful as a recording artist could be. Back then, I was an 18-year-old college student who was also in heavy training to become a music geek. This preoccupation often led to pontificating with friends about where we thought Elton ranked with the stature attained by The Beatles. Little did I know that I would one day witness a historic moment when these two musical giants came together. In June, Elton released Caribou, his latest in a string of multi-platinum records. Having made his Madison Square Garden concert debut in September 1973, his planned return two-night engagement in November would be special in that it would his first New York show to feature songs from his landmark double-LP, Goodbye Yellow Brick Road. The Garden had a tradition of featuring concerts on Thanksgiving, and the year before I had seen Loggins & Messina. Elton on Turkey Day though would be a hard ticket to score, so my friends and I planned to camp out at the Garden overnight to get the best seats. Those were the days when Ticketron (the forerunner to Ticketmaster) sold only some of the tickets while most of the prime ones were pre-printed and sold only at the venue. Tickets went on sale on a Sunday morning, so mid-afternoon the day before, a friend and I took the Path train from Jersey to the Garden. There we took our place on a small line outside the ticket booths on the Eighth Avenue side. We were about tenth in line and spent the afternoon mingling with some crazed Elton fans like ourselves. Things were quite orderly, and the line created a watchful honor system that respected our valuable positions in line and protected us from interlopers. United we thwarted off several threats from low-lives hired by the tickets scalpers to cut into our organized queue. Those savory characters also made us leery of the fact that we all had large sums of cash hidden in our socks since these were the days before credit card ticket sales. The line proceeded to grow as our waited lingered. We dined on hot dogs and pizza and freshened up in the nearby Penn Station bathroom facilities. Fortunately, around 3 a.m., there was some police activity that led to putting the tickets on sale in the middle of the night. (I presume in an effort to get us off the sidewalk!) While I was at the counter buying mine, I thought how miserable the poor lady selling them must feel for getting called to work at such an insane hour. Before the sun rose, I was back home in my warm New Jersey bed holding fourth row tickets for both nights. On the night of the show, we arrived early and mingled around the Garden floor reminiscing with some of the folks we had met on line. After a fine opening set by Elton’s new protégé Kiki Dee, we all noticed two things before the Elton John Band took the stage: Yoko One was in the audience and there was an extra microphone stand stage left in front of where I was sitting. At this time, John Lennon was estranged from his wife Yoko and was coming off his “Lost Weekend” period. However, his solo musical career was on an upturn. He had recently released the Walls and Bridges LP, and its first single, “Whatever Gets You through the Night,” a collaboration with Elton, had hit #1. Putting these clues together, we all were fairly certain what we were about to witness. As we anticipated, midway through his set, Elton paused to introduce “Mr. 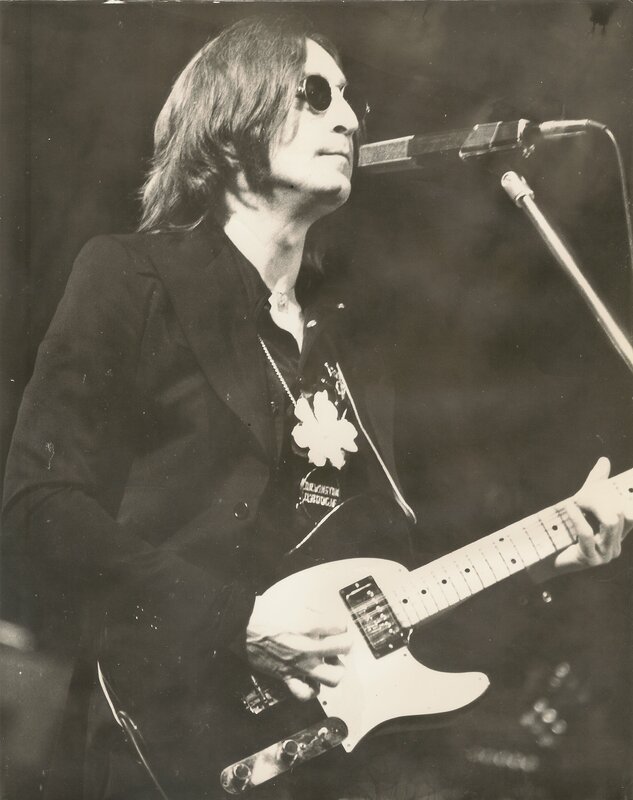 John Lennon.” Clad in a long black overcoat and holding a guitar, Lennon walked briskly across the stage to a thundering applause unlike anything I had ever heard. Guitarist Davey Johnstone let his enthusiasm show by noodling the riff to “I Feel Fine.” Then without another word, Elton counted off, and the Muscle Shoals Horns kicked the band off into a roaring rendition of Lennon’s current hit song. The band then romped through a sloppy but rocking version of “I Saw Her Standing There.” Lennon and Elton sang it together, and the Garden floor literally bounced from all the excitement. 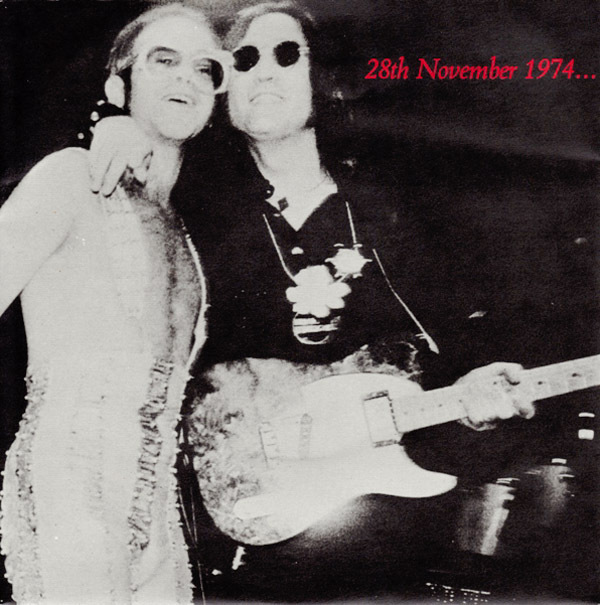 Listening today, it is a shame that Elton’s voice overpowered Lennon’s in the mix. After these fifteen minutes of euphoria, Lennon left the stage. Elton then calmed things down with his current hit “Don’t Let the Sun Go Down on Me,” and the finally subdued crowd of 20,000 responded by illuminating the arena with the glow of BIC lighters. This night would also prove historic in that it was the beginning of Lennon’s eventual reconciliation with Yoko. 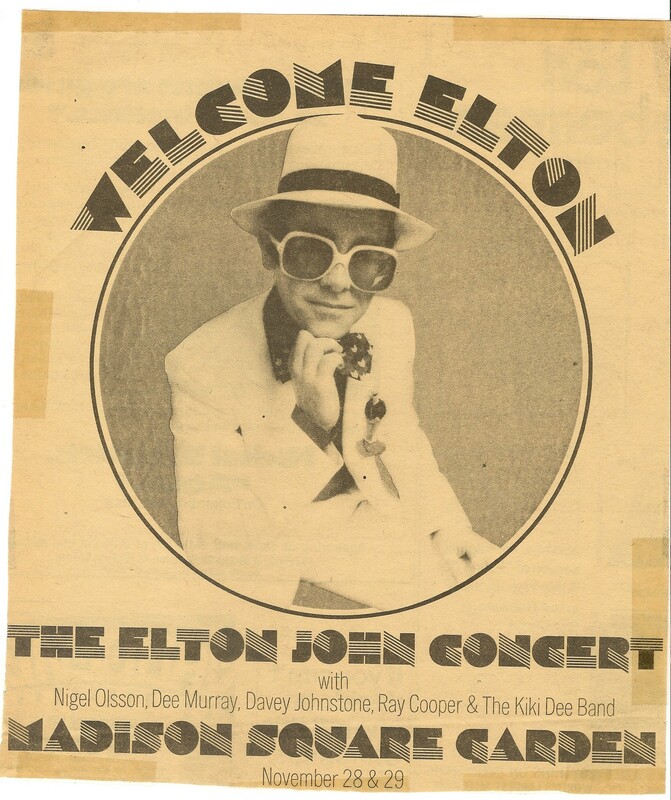 As for the behind-the-scenes details, Lennon’s first move after losing the bet, was watching Elton’s show on November 20th at the Boston Garden. But what about a rehearsal and the song selection? I recently reached out via email to Elton’s guitarist Davey Johnstone who describes the time on stage with Lennon as “absolutely magical.” Davey says that there was a one-hour rehearsal the night before in the City at either the Record Plant or Electric Ladyland studios. And for whatever reason, he said that Lennon chose “I Saw Her Standing There” because he wanted to do one of Paul’s songs. Otherwise he said, playing the two current singles just made good sense. Sadly, this performance marked John Lennon’s last live performance before his tragic death six years later. Fortunately the music was recorded and commercially released. (You can currently find the three tracks in the iTunes store.) But, regretfully the moment was not filmed, and sadly there is only a scant collection of photos in circulation. The two black and white photos shown here are ones that I bought for a $1 each from a fan at the next night’s show. Recently some rough silent Super8 video of Thursday evening surfaced on the internet. There is also another internet page featuring further reflections on the event. Looking back, this was one of the most treasured moments I have been blessed to witness. It’s hard to believe that forty years have passed, since I remember it like it was just yesterday. I vividly recall watching a rather frightened John Lennon perform while I felt so excited to be so close to a Beatle. It’s sad that John never got the chance to again become comfortable as one of rock’s greatest live performers. P.S. Look what I found after posting this. Elton stopped by New York radio station WNEW-FM the day after the Lennon appearance to co-host with DJ Dennis Elsas and had this to say about this historic event. Holy CRAP Mike, that is one heckuva memory to carry around. As worn out as the word “Awesome” is, there really isn’t another adjective I can come up with. Just wow. And forty years ago, that just can’t be… Thanks for sharing this!